You are currently browsing the tag archive for the ‘Solutions’ tag. This has been an issue for debate recently, so I decided to spend some time to investigate it. I have always been a supporter of managed solutions. But the recent debate focused around situations where managed solutions would cause deployment issues when layered over other managed solutions. Pay close attention to the section in bold. The key is to enable customization of it’s solution components. So what do we actually need to do in CRM? Go to your solution (unmanaged at this point, before exporting it as a managed solution). Look at the solution components included. Select each component, and look at the Managed Properties. 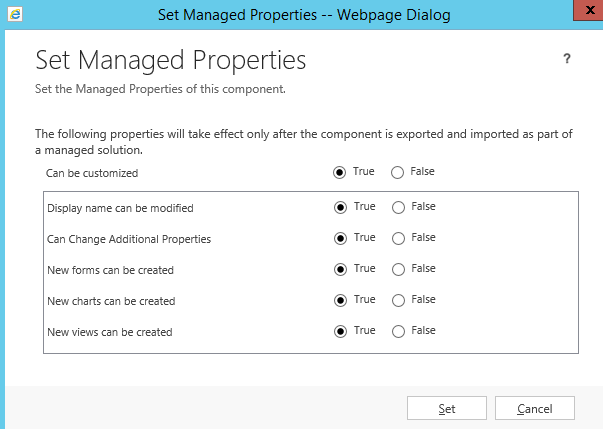 Once you open up the Managed Properties, look at the configuration options available. Set the Can be customized to true, and all the items you want to make customizable. Now you can package your solution as Managed.